Manufactured in Germany, by the TMD Friction Group, since 1913 the Textar brand has been the leading supplier of friction to the world's car and commercial vehicle manufacturers since 1913. Over four years of development and testing goes into every one of TMD Friction's OE products, and Textar brake pads are manufactured using the same materials and componentson the same production lines. Textar's application-specific engineering and technical expertise provide brake pads that areOE qualityand withover 1,400 brake pads in the Textar range, we havesolutions for around 98% of carsproduced for theGerman market.Our noise fix solutions use 70 unique shims to create bespoke products designed for individual brands and makes of car for maximum effectiveness. 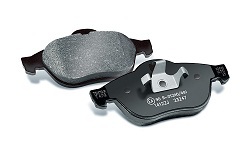 Textar brake pads are derived from 160 different formulations, some consisting of more than 20 different raw materials and each one carefully selected to meet the various requirements of a vehicle, its braking system, specific power, loads and braking characteristics. TMD specifications stipulate an even higher testing standard than ECE R 90, the European test standard to approve replacement pads. This separates Textar from its rivals, and offers distinct value to automotive part suppliers and garages. Initially developed for theO.E. market to achieve cleaner, quieter and more comfortable braking epad uses state-of-the-art friction technology and a unique blend of friction materialsto ensure that alloy and chrome wheels stay clean and shiny, and cars fitted with Textar's epad come to a stop almost silently. In addition to these excellent comfort characteristics, it won't come as a surprise that the Textar epad provides the performance expected from the world market leader in friction materials. brake fluid is to be used for brake and clutch systems if specified in the car manufacturers guide lines. brake fluid is recommended for brake and clutch systems for which a nonpetroleum fluid is specified, including ABS. low viscosity brake fluid is recommended for vehicles with ESP/ASR systems. Also suitable for all brake and clutch systems for which a non-petroleum fluid is specified.